Iredale, T. 1943. 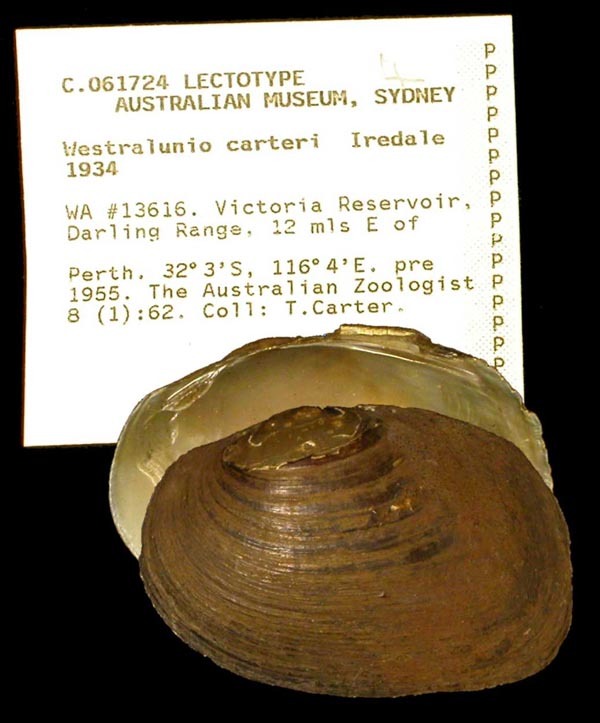 A basic list of the fresh water Mollusca of Australia. Australian Zoologist 10: 188-230. Iredale, 1934, Austral. Zool. : 64, pl. 3, fig. 11, pl. 4, fig. 11. Type(s): HOLOTYPE (ORIG. DESIG.) AMS_33006, Barwon River at Mogil Mogil, New South Wales, Australia [-29.35, 148.683 ± 1 km]. Iredale, 1934, Austral. Zool. : 64, pl. 3, fig. 10; pl. 4, fig. 10. 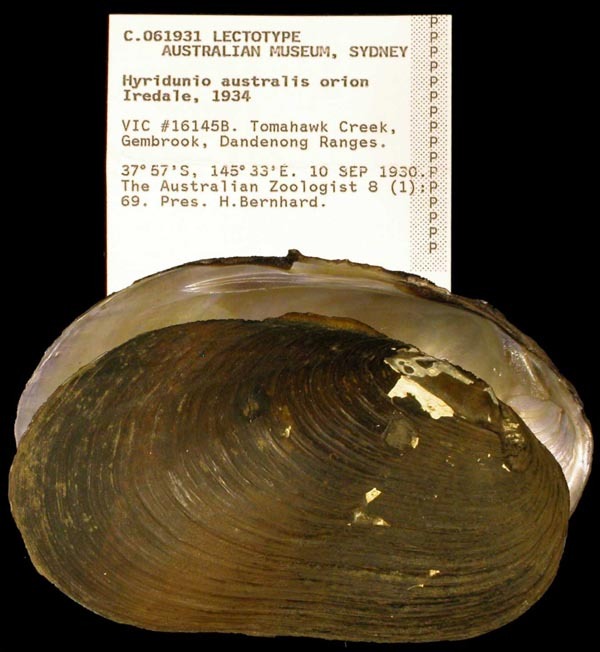 Type(s): HOLOTYPE (ORIG. DESIG.) AMS_12009, Upper Brisbane River, Queensland, Australia [-27, 152.4 ± 100 km]. Iredale, 1943, Austral. Zool. : 191. 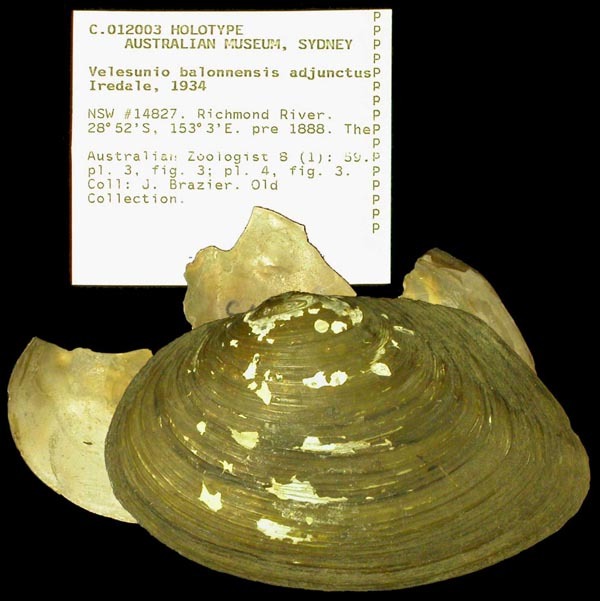 Type(s): HOLOTYPE (MONOTYPY) AMS_61739, Wenlock Downs, Wenlock (Batavia) River, Queensland, Australia [-13.095, 142.942 ± 10 km]. Iredale, 1943, Austral. Zool. : 192. 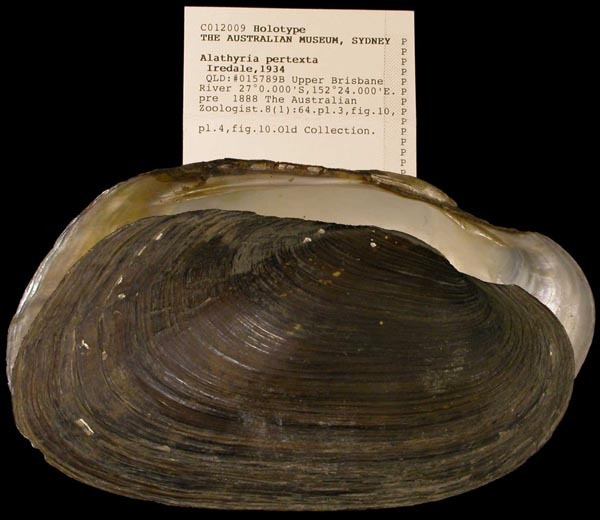 Type(s): HOLOTYPE AMS_61637, Holmes Creek, 12 mls NE Darwin (Series of pools), Northern Territory, Australia [-12.4, 130.933 ± 10 km]. Iredale, 1943, Austral. Zool. : 196. ‘Lea’ Iredale, 1934, Austral. Zool. : 66, pl. 3, fig. 13; pl. 4, fig. 13 [in part]. ‘Lea’ Iredale, 1943, Austral. Zool. : 190 [in part]. Centralhyria angasi subjecta Iredale, 1934. Iredale, 1934, Austral. Zool. : 67, 76. 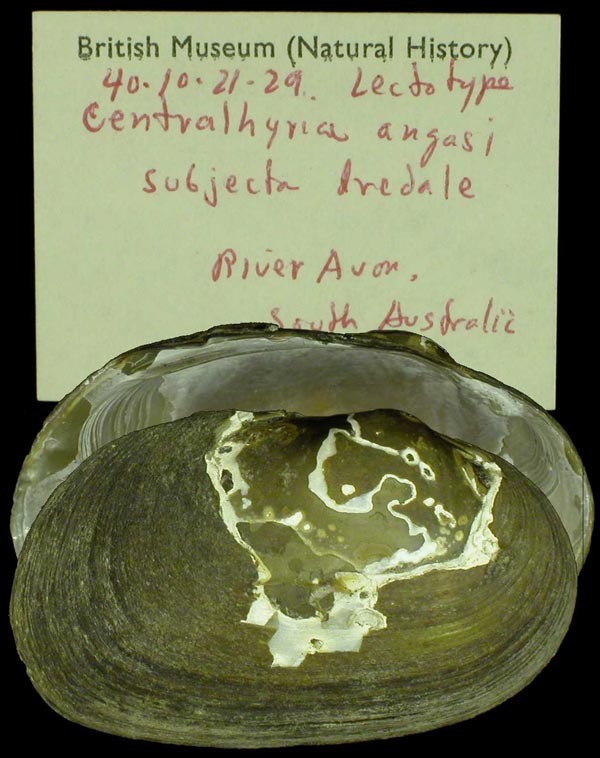 Type(s): LECTOTYPE BMNH_1840-10-21-29 (selected by McMichael & Hiscock, 1958), River Avon, South Australia. Centralhyria wilsonii caurina Iredale, 1934. Iredale, 1934, Austral. Zool. : 66, pl. 3, fig. 14; pl. 4, fig. 14. Type(s): HOLOTYPE (ORIG. DESIG.) AMS_42241, May River at Meda, Western Australia, Australia [-17.367, 124 ± 10 km]. Iredale, 1943, Austral. Zool. : 194. Iredale, 1943, Austral. Zool. : 193. Iredale, 1943, Austral. Zool. : ??. Hyridella ambigua Cotton & Gabriel, 1932. ‘Philippi’ Cotton & Gabriel, 1932, Proc. Roy. Soc. Victoria: 157. Iredale, 1934, Austral. Zool. : 62, pl. 3, fig. 8; pl. 4, fig. 8 [as ‘Westralunio ambiguus’] [in part]. Iredale, 1943, Austral. Zool. : 190 [as ‘Westralunio ambiguus’] [in part]. Iredale, 1934, Austral. Zool. : 69, pl. 5, fig. 3; pl. 6, fig. 4. 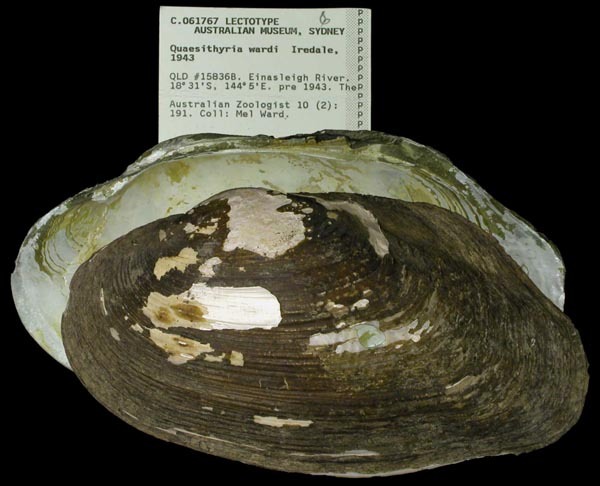 Type(s): HOLOTYPE (MONOTYPY) AMS_61936, Latrobe River, Gippsland, Victoria, Australia [-38.15, 146.783 ± 100 km]. 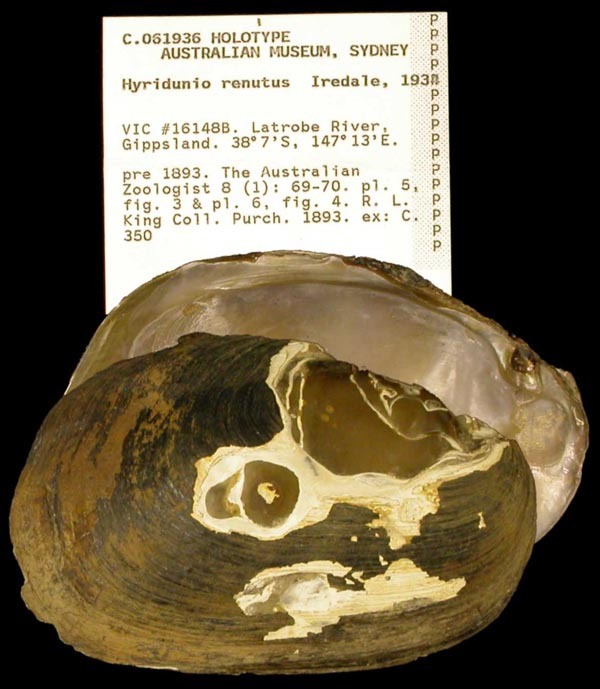 Hyridunio australis drapeta Iredale, 1934. Iredale, 1934, Austral. Zool. : 68, pl. 5, fig. 2; pl. 6; fig. 2. 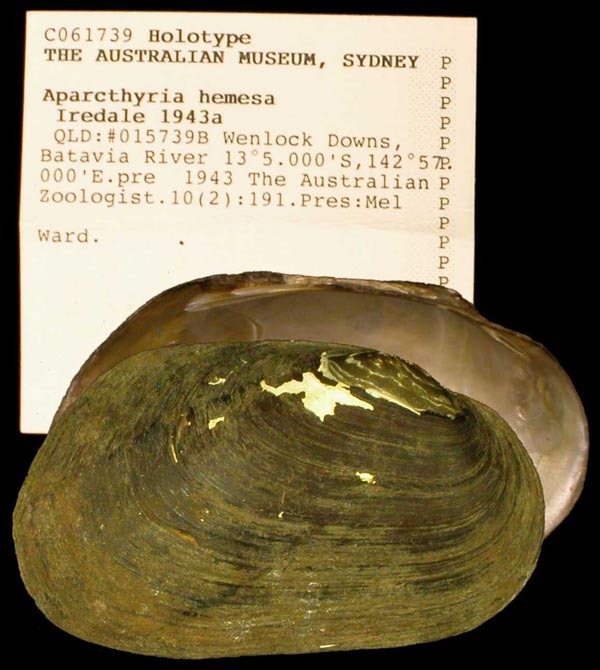 Type(s): HOLOTYPE AMS_61934, Brisbane River, Queensland, Australia [-27.583, 152.917 ± 100 km]. Hyridunio australis orion Iredale, 1934. Iredale, 1934, Austral. Zool. : 69. Type(s): LECTOTYPE AMS_61931 (selected by McMichael & Hiscock, 1958), Tomahawk Creek, Gembrook, Dandenong Ranges, Victoria, Australia [-37.95, 145.55 ± 10 km]. Iredale, 1934, Austral. Zool. : 71, pl. 5, fig. 5; pl. 6, fig. 5. 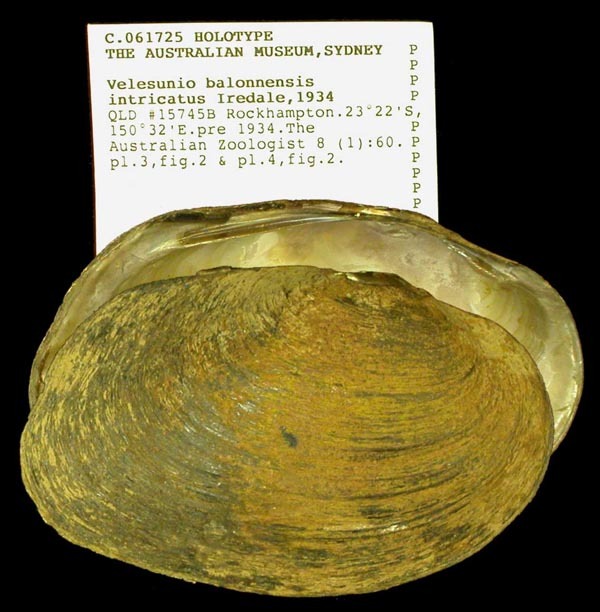 Type(s): HOLOTYPE (ORIG. DESIG.) AMS_61862, Lennard River (In river sands), Western Australia, Australia [-17.4, 124.5 ± 100 km]. 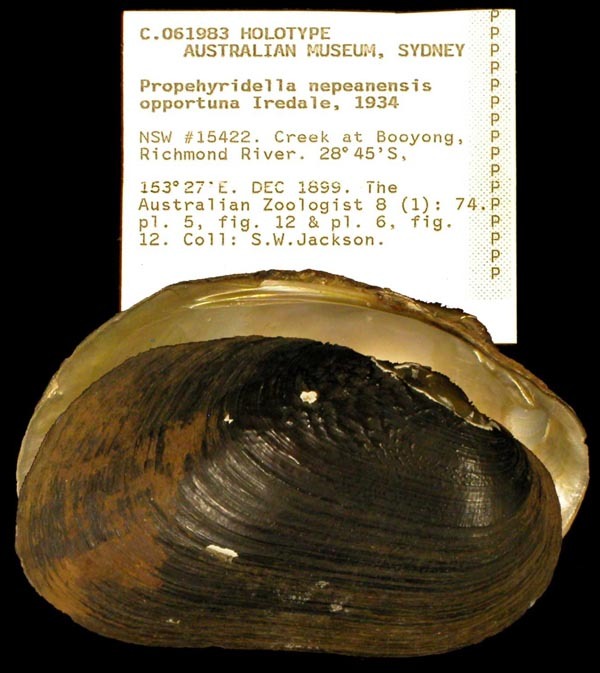 Propehyridella nepeanensis narracanensis Iredale, 1934. ‘Cotton & Gabriel’ Iredale, 1934, Austral. Zool. : 74 [in part]. Propehyridella nepeanensis opportuna Iredale, 1934. Iredale, 1934, Austral. Zool. : 74, pl. 5, fig. 12; pl. 6, fig. 12. Type(s): HOLOTYPE (ORIG. DESIG.) AMS_61983, Richmond R trib., Wilsons R, Booyong (Creek), New South Wales, Australia [-28.748, 153.448 ± 1 km]. 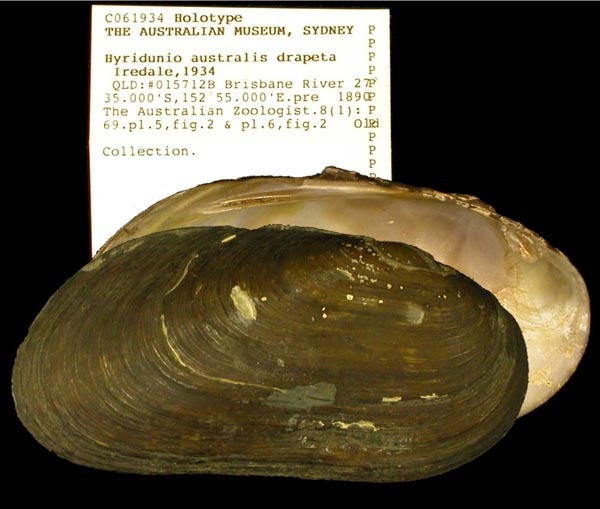 Type(s): LECTOTYPE AMS_61722 (selected by McMichael & Hiscock, 1958), Hodgkinson River, Queensland, Australia [-16.967, 145.033 ± 100 km]. Type(s): LECTOTYPE AMS_61767 (selected by McMichael & Hiscock, 1958), Einasleigh River, Queensland, Australia [-18.512, 144.102 ± 100 km]. Iredale, 1934, Austral. Zool. : 72, pl. 5, fig. 9; pl. 6, fig. 8. 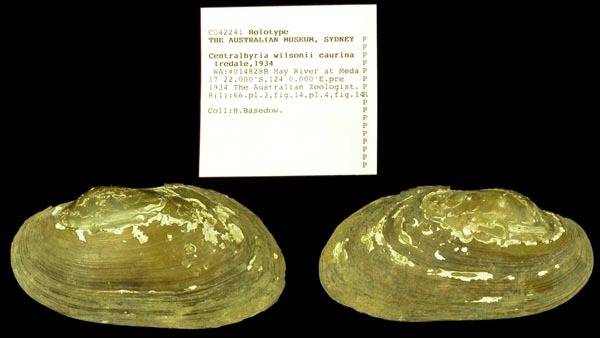 Type(s): HOLOTYPE AMS_484, Bloomfield River, Queensland, Australia [-15.95, 145.333 ± 10 km]. Iredale, 1934, Austral. Zool. : 72, pl. 5, fig. 8; pl. 6, fig. 9. Type(s): HOLOTYPE (ORIG. DESIG.) AMS_61949, Mary River at Kenilworth, N of Brisbane, Queensland, Australia [-26.6, 152.733 ± 10 km]. 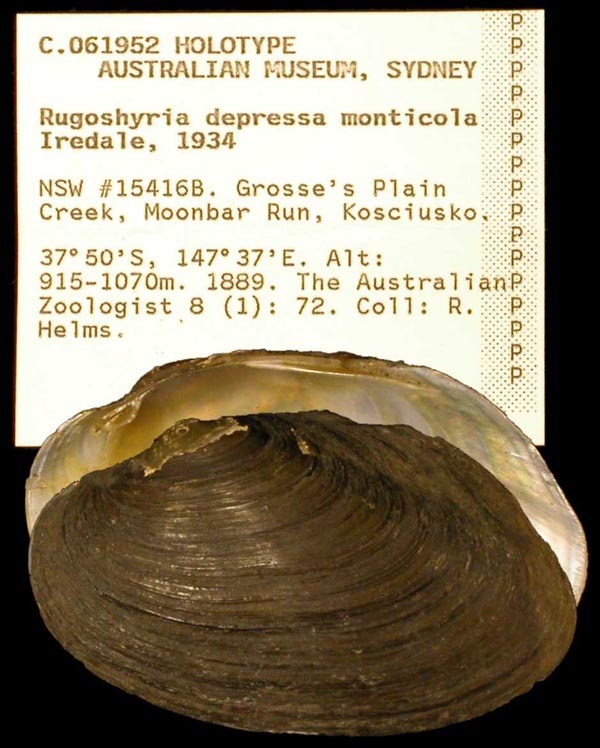 Rugoshyria depressa monticola Iredale, 1934. Iredale, 1934, Austral. Zool. : 72, pl. 5, fig. 7a-b; pl. 6, fig. 10. Type(s): HOLOTYPE (ORIG. DESIG.) AMS_61952, Kosciusko, Grosse's Plain Creek, Moonbar Run (Moonbah), New South Wales, Australia [-36.519, 148.513 ± 1 km]. 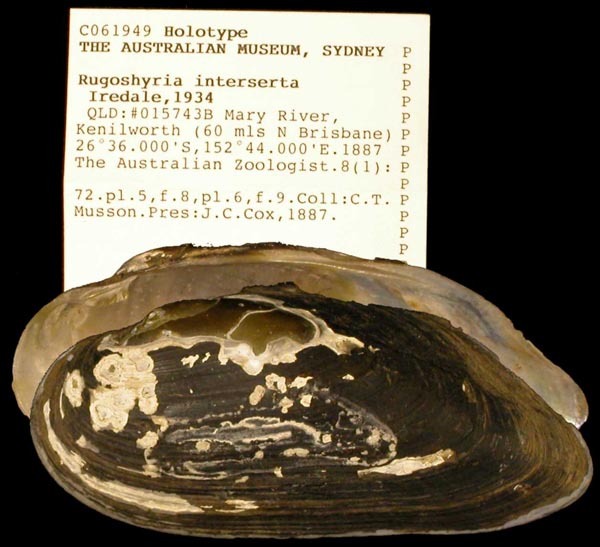 Rugoshyria depressa sodalis Iredale, 1934. Iredale, 1934, Austral. Zool. : 72. 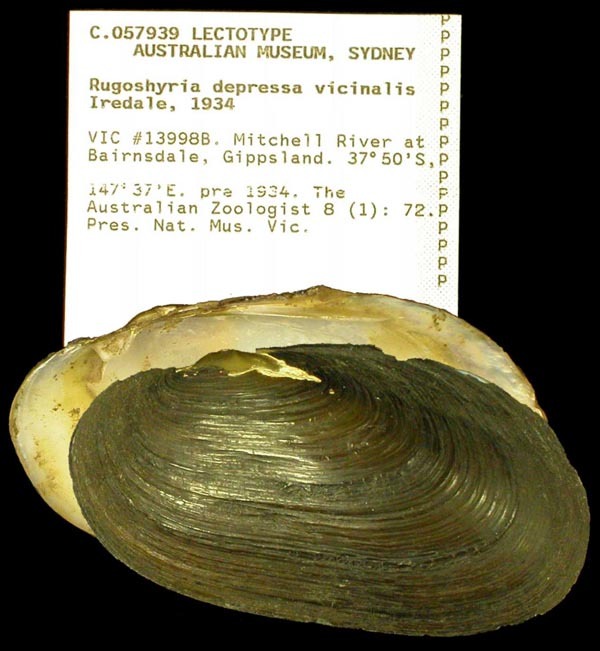 Rugoshyria depressa vicinalis Iredale, 1934. 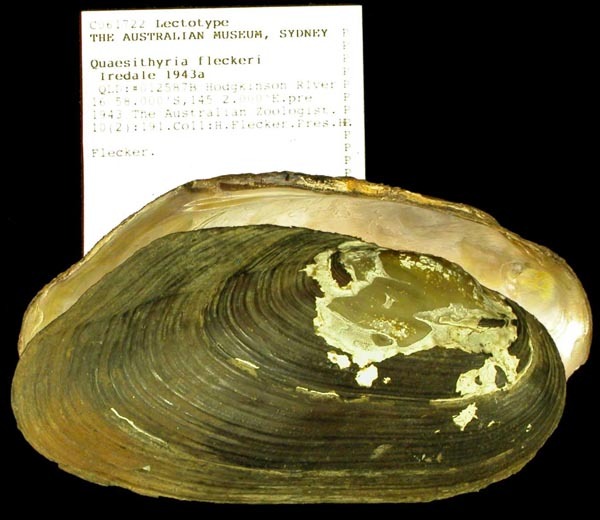 Type(s): LECTOTYPE AMS_57939 (selected by McMichael & Hiscock, 1958), Mitchell River at Bairnsdale, Gippsland, Victoria, Australia [-37.833, 147.617 ± 10 km]. Iredale, 1943, Austral. Zool. : 195. Lea, 1870, Synopsis Fam. Naiades: 184. B.J. Smith, 1992, Zoo. Cat. Australia: 20. Velesunio balonnensis adjunctus Iredale, 1934. Iredale, 1934, Austral. Zool. : 59, 76, pl. 3, fig. 3; pl. 4, fig. 3. Iredale, 1943, Austral. Natural. : 88. Type(s): HOLOTYPE (ORIG. DESIG.) AMS_12003, Richmond River, New South Wales, Australia [-28.867, 153.05 ± 100 km]. Velesunio balonnensis intricatus Iredale, 1934. Iredale, 1934, Austral. Zool. : 60, 76, pl. 3, fig. 2; pl. 4, fig. 2. Type(s): HOLOTYPE (ORIG. DESIG.) AMS_61725, Rockhampton, Queensland, Australia [-23.367, 150.533 ± 10 km]. Westralunio ambiguus carteri Iredale, 1934. Iredale, 1934, Austral. Zool. : 63, 76. Type(s): LECTOTYPE AMS_61724 (selected by McMichael & Hiscock, 1958), Victoria Reservoir, Darling Range, 12 mls E of Perth, Western Australia, Australia [-32.05, 116.067 ± 10 km]. 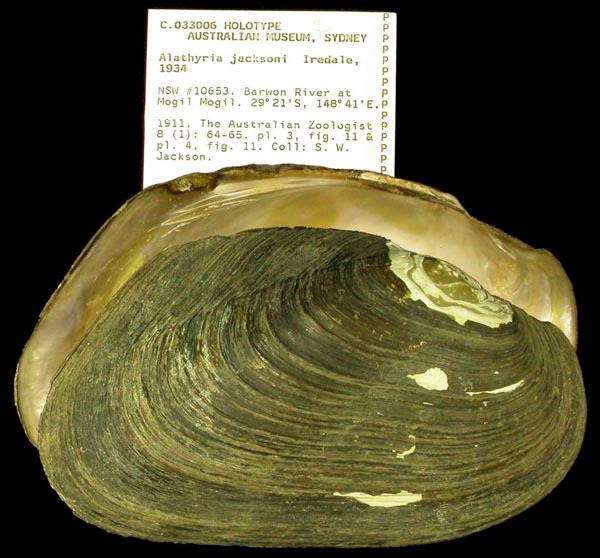 Alathyria jacksoni Iredale. — Iredale (1943: 190). Alathyria pertexta Iredale. — Iredale (1943: 190). Alathyria profuga Gould. — Iredale (1943: 190). Aparcthyria hemesa sp. nov. — Iredale (1943: 191). Aparcthyria inspecta sp. nov. — Iredale (1943: 192). Centralhyria angasi Sowerby. — Iredale (1943: 190). Centralhyria angasi subjecta. — Iredale (1943: 190). Centralhyria bednalli Tate. — Iredale (1943: 190). 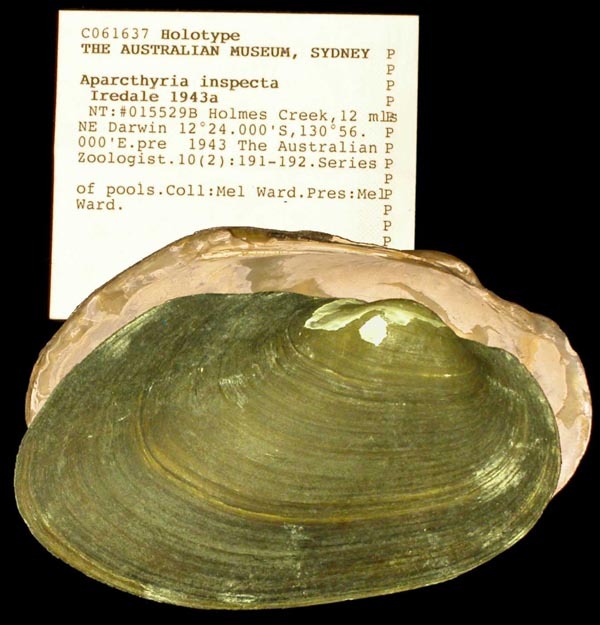 Centralhyria stuarti A. Adams & Angas. — Iredale (1943: 190). Centralhyria wilsonii Lea. — Iredale (1943: 190). Centralhyria wilsonii caurina. — Iredale (1943: 190). Cucumerunio novaehollandiae Gray. — Iredale (1943: 191). Hyridunio australis Lamarck. — Iredale (1943: 190). Hyridunio australis drapeta. — Iredale (1943: 190). Hyridunio australis orion. — Iredale (1943: 190). Hyridunio renutus Iredale. — Iredale (1943: 190). 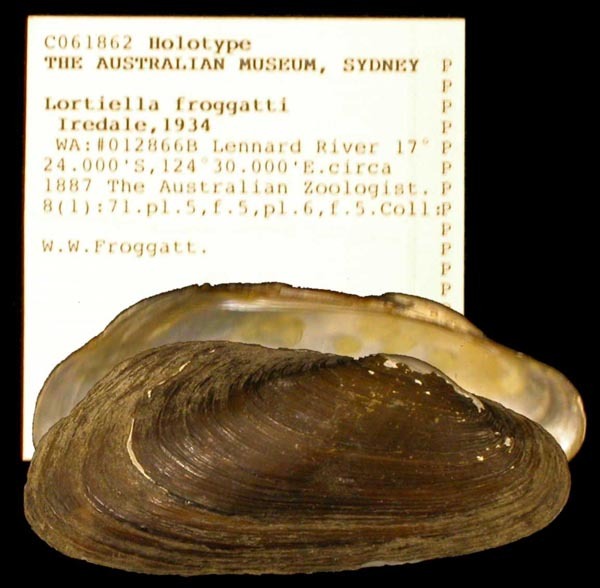 Lortiella froggatti Iredale. — Iredale (1943: 190). Lortiella rugata Sowerby. — Iredale (1943: 190). Propehyridella glenelgensis Dennant. — Iredale (1943: 190). Propehyridella nepeanensis Conrad. — Iredale (1943: 190). Propehyridella nepeanensis narracanensis Cotton & Gabriel. — Iredale (1943: 190). Propehyridella nepeanensis opportuna. — Iredale (1943: 190). Quaesithyria fleckeri sp. nov. — Iredale (1943: 191). Quaesithyria wardi sp. nov. — Iredale (1943: 191). 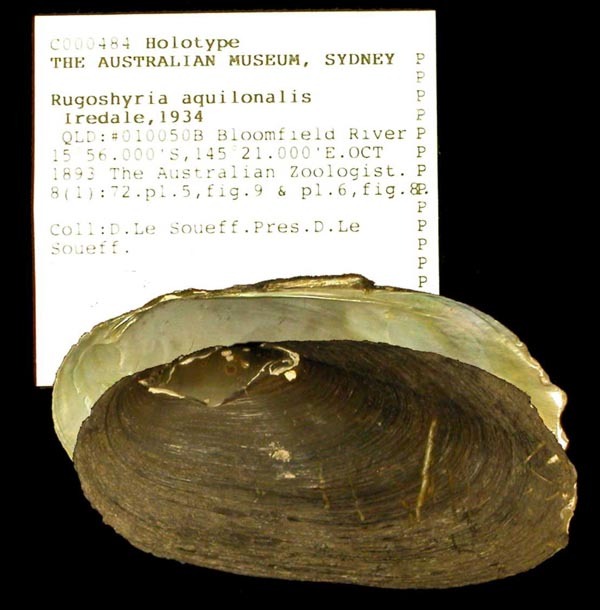 Rugoshyria aquilonalis Iredale. — Iredale (1943: 190). Rugoshyria cultelliformis Conrad. — Iredale (1943: 190). Rugoshyria depressa Lamarck. — Iredale (1943: 190). Rugoshyria depressa monticola. — Iredale (1943: 190). Rugoshyria depressa sodalis. — Iredale (1943: 190). Rugoshyria depressa vicinalis. — Iredale (1943: 190). Rugoshyria interserta Iredale. — Iredale (1943: 190). Velesunio balonnensis Conrad. — Iredale (1943: 189). Velesunio balonnensis adjunctus. — Iredale (1943: 189). Velesunio balonnensis intricatus. — Iredale (1943: 189). Velesunio danellii [sic] Villa. — Iredale (1943: 189). Velesunio evansi A. Adams & Angas. — Iredale (1943: 190). Velesunio shuttleworthi Kuster. — Iredale (1943: 190). Westralunio ambiguus Philippi. — Iredale (1943: 190). Westralunio ambiguus carteri. — Iredale (1943: 190).